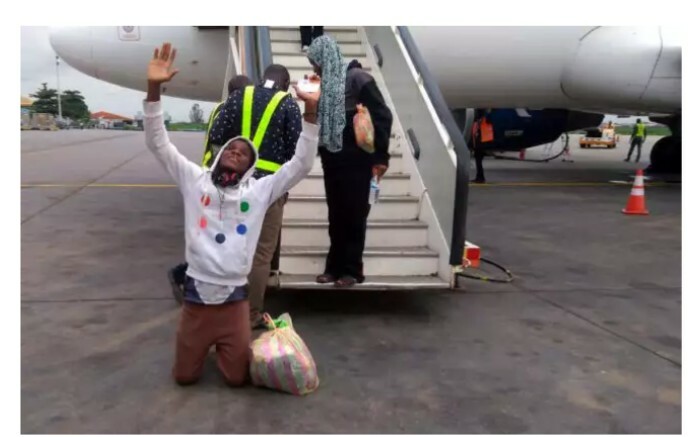 As more and more Nigerians continue to repatriate from Libya, the National Emergency Management Agency (NEMA) has yet received another batch of 193 displaced Nigerians from Libya. Acting Zonal Coordinator of NEMA in the South West, Mr. Segun Afolayan made this known in Lagos on Friday while speaking to journalists. According to Afolayan, the returning Nigerians arrived at the Cargo Wing of the Murtala Muhammed International Airport, Lagos at 8:33pm on Thursday night on a chartered Nouvel Air plane with the registration number UZ 189. He said the Nigerian citizens were repatriated back home with the help of the International Organisation for Migration (IOM) under its Assisted Voluntary Return Programme. Afolayan called on Nigerians to desist from stigmatising against returnees who went outside the shores of the country to seek for greener pastures. “It is a right for everyone to live free and comfortable lives but the process or the means of seeking the fulfillment of the rights are the ones in contention. “Many of these innocent victims are not aware of the dangers on the means and the routes of the journey. They fall easily to the deceitful and deceptive promises of better life outside the country. “Nigerians need to accept the challenges of the menace of irregular migration as evil and inhuman and all hands must be on deck to save our innocent youths from embarking on such perilous journeys henceforth,” he said. He counselled the returnees on the need to maintain a positive atittude and not to be discouraged by their unfortunate experiences in Libya, saying that their primal goal now is to make a living in Nigeria. Afolayan said the Federal Government, IOM and the European Union have been helping the returnees by empowering them with skill acquisition and providing opportunities for them. He used the medium to call on the private sector to also join in rehabilitating the returnees.